I HAVE BEEN ATTACKED by lea ches at Stringybark creek, and I have caught some of the most nastiest colds and flu's walking around the Glenrowan siege site at early hours. Yes I have done it all! I have tried to find all the Kelly sites, some with success, others without, but my favourite gang member was of course Ned Kelly. Until, one day I thought of Joe and how quiet his story is; nobody seems to really know about him. 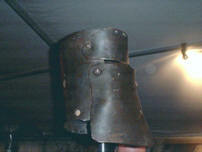 When I attended the commemorative dinner at Glenrowan, to celebrate the anniversary of the siege at Glenrowan, Joe's armour was the main feature, Seeing his armour close made it the last straw; I now decided to do a Joe Byrne site. The reason Joe is my favourite over Ned, Dan and Steve is because of his loyalty to Ned, he was so loyal to Ned, he claimed after Aaron was told by Joe to tell Nicolson, that rather than give himself up, and escape the death penalty, �..I would die at Ned's side first...� Now that coming from a man, who was reported around the Woolshed where Joe and Aaron grew up, that he was a quiet and likable lad, completely amazes me. 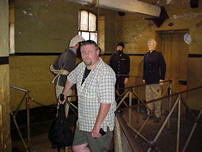 As Joe's death at Glenrowan was well recorded by James and Kate Reardon, Dan and Steve's was more preserved. Ned's was the best recorded. At an age of 9, my step father, Gary Boness, my mother Lynne and myself, drove through a township, which in turn was noted for " The scene of the Kelly siege " I was enthralled, as we drove through this quiet beautiful hamlet, I finally persuaded my mother to stop the car for a look around town, as I stepped into Kate's Cottage, I heard a lot of the word " Kelly " I had to know who this was. I purchased my first Kelly book, "Ned Kelly: The Larrikin Years " by Graham Jones. As we were leaving town, my mum said we should stay the night, I was over the moon. We stayed at the local caravan park, and that night went to Bob Hempel's, Anamatronic semi - live show, which at an age of nine for anyone who has ever been in the show would know is very exiting I learnt of Aaron Sherritt who at that time I was under the understanding he was a traitor. Right: My mum, putting on a brave face after a trip to Stringybark. The show introduced me to the Kelly gang, at the end of the show, I was all exited of how, I was going to learn all about the Kelly gang, and in my own words " I will write a book about them " I remember this well because I remember my dad saying that I was going to lose interest one day. I didn't listen. On our return to our caravan, mum and Gary virtually went straight to bed, I sat up and read this story of Australia's most unique figures, and before I knew it, I had read half of the book. At the age of nine, I had read the most amazing story in my whole life. I was over whelmed and next morning I was first up, and began hoeing into my new book again and had finished it before every one was up. I know knew the Kelly story better than any other nine year old. That book lead me to my life as it is know, and as I think back, if I hadn't picked up that book that day, I wouldn't be who I am today. That day and ni ght in Kelly Country had effected me forever, and pushed me from boy hood into the world of the Kelly gang. As I grew older and older trips into Kelly Country became frequent, my life was taking shape. I remember many of these trips, and the excitement before getting there, was un bearable. 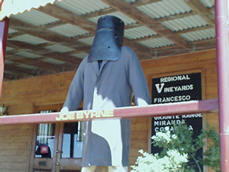 Left: Joe Byrne at 'Buffalo Mountain Wines' Glenrowan. At 14 my life was there in front of me I had to just take it, and that I have, and are pursuing the Kelly gang, Meeting Matt and Brendan, introducing me to Ian Jones, noted Kelly Arthurian, Ned: the exhibition, and the mates I have gained over the years has been un - real, an after returning from that trip, on the day of school, I had drifted from my child hood friends and pulled into the new world. A trip to Joe Byrne's homestead site, changed me forever; Joe, was beginning to tower over Ned and the boys, and becoming my favourite. 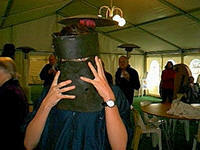 Then, seeing his armour at the centenary dinner, was the last straw, I had to study Joe. Now he is my world. High school became another hard factor, my mates would want me to come out after school, I have no time, I am always reading the Kelly books or updating this webpage. My life will continue to be the Kelly gang way it is now. If you have any questions, queries, feel free to email me. THE CENTENARY DINNER, GLENROWAN 28TH JUNE 2002. The Kelly gang centenary dinner, to commemorate the siege at Glenrowan 122 years previous. I attended this dinner which I must say was very good, I will guide you through the events which took place at this very special event. At 7pm I arrived at the door, waiting there, it was a cool night, the cool breeze was lovely, as we (Rod and Chris Gerrett & Myself) shuffled in through the door, and we yacking in each others ear for the passing of the next few minutes, me and Ian Jones had a quick chat, then the main event of the evening had arrived on hors e back, Joe's Armour was been ridden into the famous battle site of the police and the gang, I thought I seen a few tears roll down some eyes once or twice during the night. As the armour was carefully taken from the horse, it was walked through the mounting crowd, and was set up inside, the excitement of getting into the next room was un bearable, eventually we moved onto into the next room, we were seated, and all began talking. All focus was on the armour, everyone seemed to be hovering around it, I waited until everyone cleared, and I got my look, and I was moved inside, I took notes in my mind of how it looked, and eventually, I sat down and waited for the tucker. Along came the food; but I wasn't too concerned about filling my stomach, I still wanted too touch that arm our, as I glared at it from my seat, I couldn't believe it was actually here, at the famous siege site, were I thought it would never return. A few speeches were made, funding for the Kelly Tourism in Glenrowan, and, also that this event will be a yearly event, which is great news, Joe Online will keep you posted when the next one is almost looming. I walked outside to view the peaceful and my personal favourite site of the Kelly gang. More speeches came, and then, Ian Jones took the microphone and blasted us with his Kelly expertise. As the night rolled on, the music from the sheds filled the coldness of the Kelly Country breeze, and me and Ian began to talk about the site of Ned's capture. Eventually, the night had ended, I watched as the armour was packed away, and we were off talking we were the last to leave, and, enjoying the night thoroughly, I went around the siege site for my last look until next morning, and eventually headed home, enjoying myself to the fullest! I highly recommend anyone who wishes to go you will not regret it! For all his support knowledge, and just being the best mate of mine that he is, he is one good fella, Mark, manages to scratch his Kelly knowledge into text on my other Kelly site Kellyoutbreak. Mark, I can't express how much you have helped, backed me, and plainly always been there for when I needed him most. With these two where do I start? Matt and Brendan have basically become brothers to me, and Mark included we have in my eyes became a small family, I care for them as much as I would my own brother, and the so many things they have down, put themselves in difficult positions, to help me. They have bent over backwards to help me, and I can not be appreciative. As above I was talking about our " Family " Me, Matt, Mark & Brendan, are the children, well Rod and Chris are the parents! Rod and Chris run the Excellent and may I say the Best Kelly store in the world, by the name of Kates Cottage, they sell everything Kelly gang. They have been so supportive, allowing me to help in their Museum, Has privileged me a lot. DAVE WHITE AND NICKY COWIE. Things like that inspired me to keep going. Dave and Nicky also have there own Kelly website at www.bailup.com have a look! Good ol' Ashley, we had a remarkable talk at the Centenary dinner at Glenrowan to commemorate the siege 122nd anniversary. We spoke for a length and shared equal views, and Ashley was surprised to see that my favourite was Joe. Ash inspired me that night. Ashley performed the Wonderful NED KELLY cd, which has the most remarkable songs, and are very emotional. 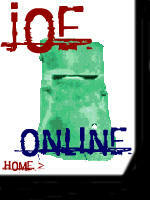 Ashley's Ned Kelly songs will be performed live soon, Joe Online will keep you posted.